Online retail giant Amazon has become the latest company to move into the daily deals space with the launch of AmazonLocal, an online marketplace that will allow its customers to buy vouchers or deals that can be redeemed against goods or services from local businesses in a customer’s local area. 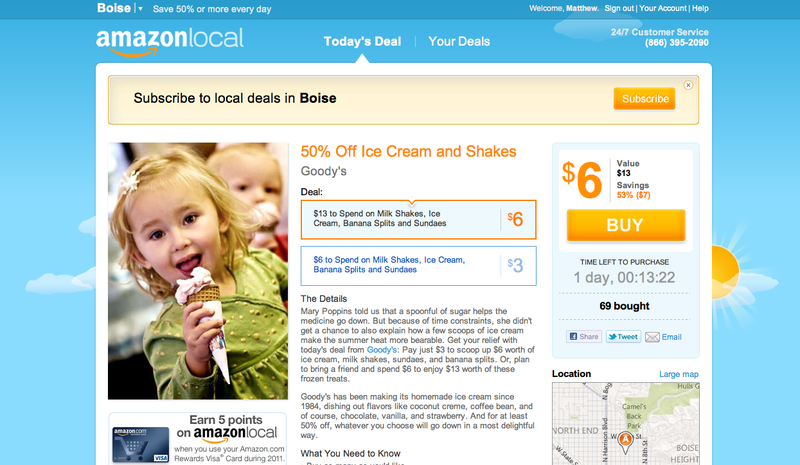 Currently, the AmazonLocal website appears to be available for Amazon customers residing in Boise, Idaho. The company says this is because of Boise State Unversity’s unique blue football field, which is affectionately referred to as “Smurf Turf”. [The] blue football field represents just the kind of adventurous spirit we want our customers to experience every day. We will quickly be expanding to other cities, but we liked the idea of starting in a city that embraces fun. The service will operate in the same way as Groupon and LivingSocial (and Facebook, Google et al), offering a deal for a limited period of time, saving customers over 50% on each deal. However, Amazon appears to be going down a different route, partnering with other companies that will source deals for its customers. If you think it is similar to LivingSocial when you use it, that is because it has become Amazon’s first provider of deals. Each deal purchased via AmazonLocal is stored in the Your Deals section, allowing you to view at-a-glance your previous orders or print off vouchers to use at the participating retailer. Until December 31, users can earn 5 points for every dollar at AmazonLocal with the Amazon.com Rewards Visa Card, after this time customers will be able to earn 3 points on each deal. Read next: Are ergonomic peripherals useful? My unscientific and anecdotal evidence says yes.